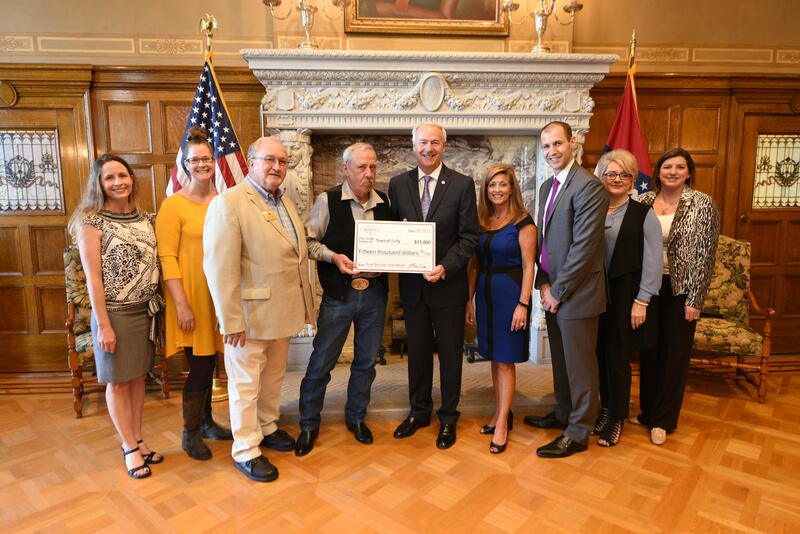 Governor Asa Hutchinson, AEDC Executive Director Mike Preston, AEDC Executive Vice President of Operations Amy Fecher and Rural Services Director Alex Johnston presented $246,225 to 21 rural communities selected for funding through the Rural Services Rural Community Grant Program for Fiscal Year 2018. The grant awards were distributed October 10th at an awards ceremony held in the Governor’s Conference Room at the Arkansas State Capitol. In attendance were representatives receiving an Arkansas Rural Services Rural Community Grant award on behalf of Rudy in Crawford County. The Town of Rudy received $15,000 to renovate the city park including removal of an existing storage building and construction of a new one. They will also be adding electricity to the concession stand and updating the stage pavilion. The Division of Rural Services works in partnership with the Arkansas Rural Development Commission to select the Rural Services Rural Community Grant recipients. Incorporated cities and towns and unincorporated communities in rural areas of less than 3,000 in population are eligible to apply for assistance through the Arkansas Rural Community Grant Program. All Arkansans are invited to attend the 2018 Rural Development Conference in Little Rock May 22nd -24th. Attendees will learn about additional programs and funding opportunities available to Arkansas’s rural communities. Over 75 state legislators will join over 600 mayors, county judges, other state and federal officials, and community leaders to participate in this annual conference. For more information about the Rural Development Conference or Rural Services grant programs, please contact the Division of Rural Services at 1-888-RURAL-AR. Pictured from left to right are: ARDC Commissioner Elizabeth Walker, Tracee McKenna of Western Arkansas Planning and Development District, State Representative Bruce Coleman, Mayor James Jones, Governor Asa Hutchinson, AEDC Executive VP of Operations Amy Fecher, AEDC Executive Director Mike Preston, ARDC Commissioner Lynn Hawkins, ARDC Commissioner Jamie Pafford-Gresham.